Take this early trend heeding. Get a jump on the eclectic footwear trend that was all over the recent European Mens Spring/Summer 2018 Runways. 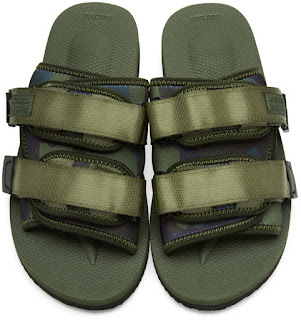 There were lots of sandals in hiking trail, beach and Birkenstock styles in a bevy of colors and materials. Here's one example a year in advance to snag now from Suicoke and their new collaboration with urban powerhouse Stussy. 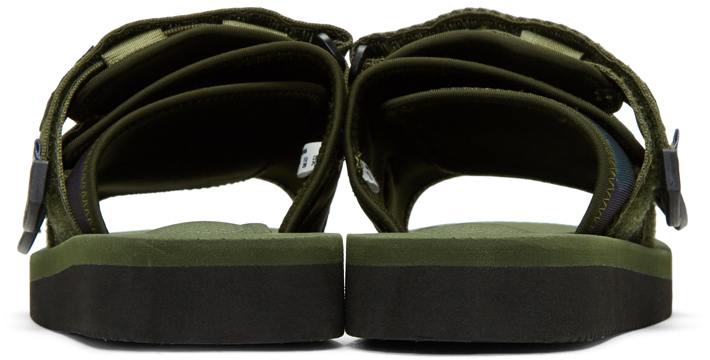 The Green Stussy Edition Moto Sandal features a brown, green and blue camo neoprene printed upper with green nylon velcro straps and the characteristic Suicoke zig-zag stitching for added texture and dimension. The two-tone sole is a made of tonal and treaded Vibram® rubber. Accenting the upper are logos from both brands. This is a fun collaborative sandal that is both cool and comfortable. Give it a try, barefooted or with socks, and see how plausible this style is for those of you who usually tend to shy away from sandals in the Summer. Available now at Ssense.com.